Alice Neel, (1900-1984) "Claudia Bach Pregnant," 1975. Oil on canvas, 32 x 45 7/8 in. Art by Women Collection, Gift of Linda Lee Alter and now part of the "The Art World We Want" exhibit at PAFA. There's only one Chuck Close exhibition currently on view in the United States. It's at the Pennsylvania Academy of Fine Arts (PAFA) Museum on North Broad Street, and you need to walk through another show to get to it. This is unusual for the prominent contemporary artist – known for monumental photorealist portraits of prominent figures such as President Bill Clinton and the Dalai Lama – who typically participates in a few exhibitions a year and has a long list of solo exhibitions under his belt. But following a series of eight allegations of sexual misconduct against Close that began emerging in December 2017 and amidst the current #MeToo movement, museums have been questioning whether they should be leaving his work on the walls. A solo Close exhibition was scheduled to open at Washington D.C.'s National Gallery of Art on May 13, for example, but was indefinitely postponed following the allegations. In January, Seattle University removed a Close artwork that was on display in a library, and Los Angeles' Broad Museum is reportedly questioning whether it should do the same. At PAFA, however, Chuck Close Photographs, a survey of around 90 photographs spanning Close's career, has been up since early October and will remain on view for its intended duration until April 8. This comes not without a disclaimer, or, what a recent New York Times article suggested museums should include for artists with questionable personal behavior – a contextualizing asterisk. The asterisk, or side-note addressing the problematic issues behind the artist as an individual, is in the form of a new exhibition that was installed at PAFA recently in the gallery space adjacent to the Chuck Close exhibition. Titled, "The Art World We Want," and drawing upon works from PAFA's permanent collection, it deals with issues of power, gender, race, and sexuality. Guerrilla Girls, “Hormone Imbalance, Melanin Deficiency,” 1993 Postcard, 18 x 12 in. and now part of the “The Art World We Want” exhibit on display now at PAFA. "The 'real world' will continue to come through our institutional doors, whether it is sexual allegations against an artist in our collections or on our walls, or other violent and unbearable issues," says Brooke Davis Anderson, the director of the PAFA Museum. "The 21st century museum that ignores the news of humanity knocking at their doors will be abandoned by their audiences, become irrelevant. The 21st century museum that engages in the conversations and debates, arguments and heartbreaks, regardless of how inexperienced we may be in such dialogues with their audiences are the institutions that will find supportive audiences – engaged people." "The Art World We Want" engages visitors with four thematic questions: Who has the power to speak about women's bodies? What other myths has power enabled? Who do we need to hear more from? How do we get from here (February 2018) to there (2050)? Works by women artists such as Kara Walker, Alice Neel, and Barbara Kruger are exhibited, and noticeable attention is paid to including people of color. Despite this attempt, as the first and oldest art school in the country, PAFA has traditions that may be difficult to shake. Many of the works by women artists included in "The Art World We Want" only entered the museum's collection in 2010 and were gifts from Linda Lee Alter, a private donor who purposefully collected works by women artists that were drastically underrepresented in museums. It is thanks to Alter's gift that PAFA accessioned its first works by major women artists such as Louise Bourgeois, Kiki Smith, and Ana Mendieta to its collection. A couple of exhibited posters by the Guerrilla Girls – an anonymous group of feminist activists that lobbies for gender equality in the art world – also raise questions about PAFA's historic treatment of men and women artists. 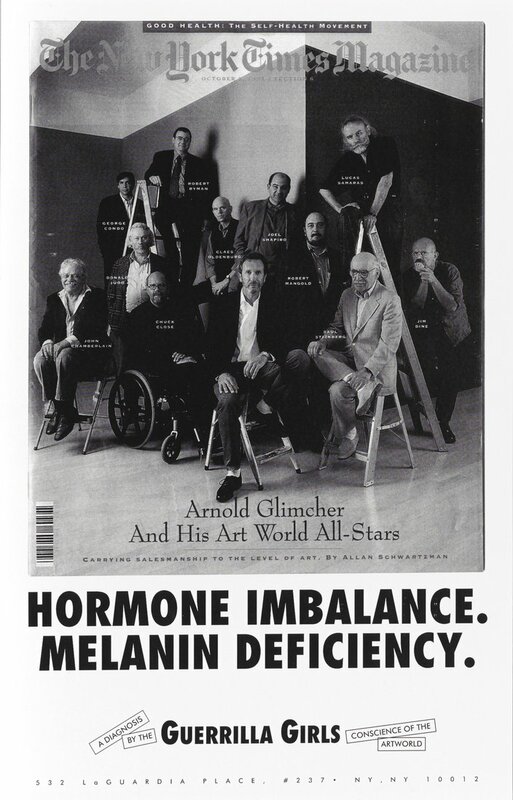 One poster titled, "Hormone Imbalance, Melanin Deficiency" (1993) appropriates a New York Times Magazine cover depicting a group of 12 white men, bearing a headline that refers to them as "Art World All-Stars." The grouping includes Chuck Close, whose work is exhibited next door, and Claes Oldenburg, whose large-scale Paint Torch sculpture has been permanently installed outside PAFA since 2011. Another Guerrilla Girls poster tallies up how many women have had one-person exhibitions at major New York City museums in 1985 and, again, in 2015. (The numbers range from zero to two, with little difference over the 30-year period.) PAFA, by comparison, is a bit above the Guerrilla Girls' average, with 21 solo exhibitions of women artists over the past 10 years – a time period during which there have been more than 100 exhibitions in total. By comparison, there have been 39 one-person shows featuring male artists during the same time period. "The Art World We Want" addresses the allegations against Close instead of removing his works from public conversation. Visitors cannot enter Chuck Close Photographs without walking through "The Art World We Want," forcing them to confront the recent allegations against Close. At the same time, though, the positioning of this group show outside a solo exhibition of a canonical male artist – and in a gallery space that simultaneously functions as a stairwell – may perpetuate the perception that works by the exhibited artists are a marginal asterisk. "Art museums and art schools must own their role in perpetuating the status quo," reads the wall text at the entrance to "The Art World We Want." "Only through honest debate and dialogue will we be able to articulate how the future art world must be different."